I have just returned from my four-week photo safari in Kenya. What an incredible experience it was! Most of it has all been documented on video with nearly 5TB of video & interview footage (which will be edited over the next couple of weeks). 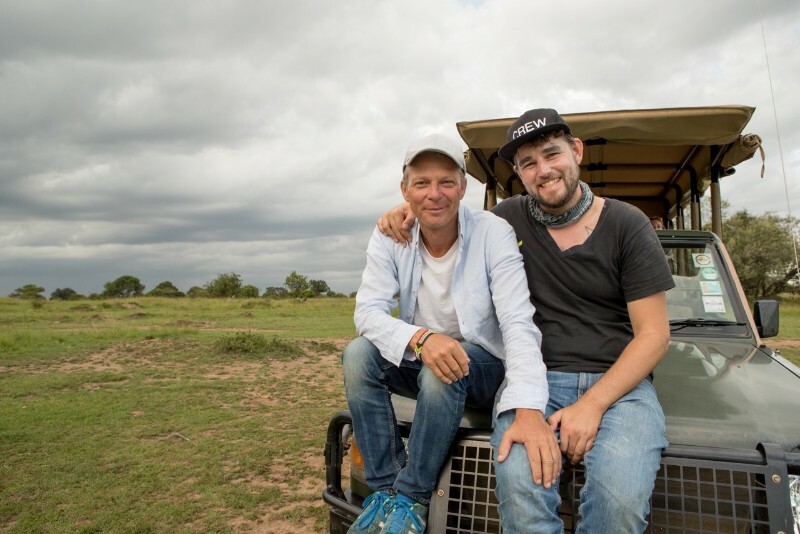 Dean Paarman (who accompanied me specifically for this trip) and I made a fantastic team and it was a lot of fun creating the video footage and doing the interviews in the bush. While he focused on the “about me” and filming for the lodges we stayed at, I concentrated on filming the animal footage. To be the first to view our amazing footage and our many incredible experiences subscribe to my YouTube Channel. I am so grateful that I was able to do this journey, but I must admit the long days out in the bush and irregular meals were quite trying at times and used a lot of my energy – but the joy and determination to share my passion kept me going. We stayed for a week at the Tortilis Camp in Amboseli National Park. Tortilis is the perfect location for exploring the Amboseli area, with excellent staff. The views of Kilimanjaro are magnificent. Due to the masses amounts of rain we had, the mountain was covered in clouds for weeks, we were finally able to see the top of the mountain before we left, and it was an incredible site to behold. 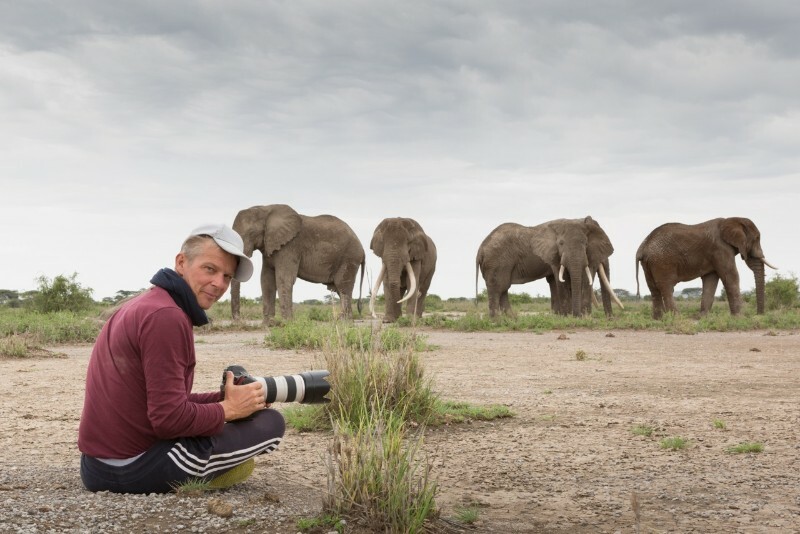 One of the highlights were to visit and experience the extraordinary Big Life Foundation and exploring the conservancy outside of the Amboseli National Park which is home to some of the last biggest remaining elephants in the world. I had the opportunity to photograph some of them in their herds and a few individual shots, but the one incredible experience I had was with the strong elephant bull, “Tim” that took my breathe away: lying on the ground with my camera, portraying “Tim” who was standing about 18m away from me with his huge impressive tusks, almost reaching to the ground – in this moment I fully trusted our safari guide in reading the bull’s language. I will remember that moment forever. I can’t wait to share the final picture with you! Returning to the Masai Mara filled me with a special spirit. It was so great to see John again, my Massai Guide and friend with whom I share about 7 years of friendship and who was my safari guide when I visited the Mara my very first time. It felt like coming home. Staying at Ngensche Camp with their friendly and welcoming hospitality, contributed to our amazing experience. Ngensche is perfectly situated in the middle of the Mara and I had easy access to the Conservancy and going on safari. It seemed that the rainy season had started a bit earlier this year and brought us rain every day. We got stuck in the muddy tracks often and experienced flooded bridges and river crossings that were impossible to cross. One special sighting was a leopard in a tree with her two cubs. It looked as if she was about to hunt soon, but she made us wait and for hours nothing happened. Eventually in the late afternoon she came down from the tree and started to move into the open plains and I was able to portrait her with her two cubs. It was a difficult shot because the light was almost gone, but it was worth waiting for! This picture will definitely be a new addition to my Pride of Africa Collection! Watch this space as it is coming soon. The next two weeks were all about my family and showing them around the Mara. Staying at Tipilikwane Camp near Talek, which we used as our base to head off on safari and start exploring the Mara. I revisited a few sites where I had captured some of my previous Pride of Africa photographs. It filled me with much joy seeing my kids so fascinated by the animals we encountered along the way. I introduced my children to John’s family, we had a great lunch and visited the school his children go to and that he supports. My son in particular was highly fascinated by John and his Masai friends who showed him how a Masai warrior dances and jumps, along with how to make a fire with just a stick. On our way to Angama Mara situated in the Mara Triangle between Serengeti / Tanzania and Masai Mara a detour was required due to the Talek River water level being too high. Some things happen for a reason though as it turned out that due to the different route we took, we came across a special Cheetah female named “Imani” with her three two-month-old cubs. The fascinating part came when the Cheetah mother decided to cross the Sand River towards Tanzania with her cubs following her. It was a nerve wracking experience and our hearts went out for the little cubs seeing them struggle while trying to swim across the river. Besides the two rangers we were the only people witnessing this special moment which I captured with my camera and recorded onto film as well. I hope to have the film material ready soon to share this very special story in detail with you. Angama Mara – which means in Swahili “suspended in mid-air” is a truly remarkable lodge in every aspect. The view is just breathtaking. Having breakfast on the patio literally hanging over the cliff and seeing the eagles gliding below you is just amazing. 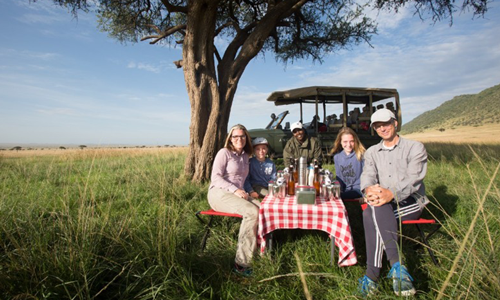 We experienced not only a classic safari but also had a bush breakfast and lunch under magnificent old trees right in the open plains. We went on an educational walking safari with a tradition Masai naturalist and enjoyed sundowners and a bush barbecue under the stars. When you are at Angama you almost feel like you don’t want to go far, as you are pretty happy spending your day in its surrounds as it is so majestically beautiful – it was good for our souls to take in all that beauty which surrounded us. While staying at Angama I got the rare opportunity to fly in the Mara Elephant Project helicopter and the CEO Marc Goss as pilot. This was truly an epic adventure and a totally new perspective for me to experience the Masai Mara. These are just a few of the highlights of my four week photo safari in Kenya. There were so many more smaller experiences and special moments with people of the Masai Mara which we hope to share with you soon. I would like to express my special “thank you” to all lodges for their hospitality and all the people we met along the way. You made this trip very special! Stay tuned! there is much more to come! Subscribe to our Youtube Channel so you are first in line to see new videos. Really amazing photography and a great story. Wonderful to share your and your family experiences. Klaus you are truly blessed.